'Ladies and gentlemen, as some of you may know, my name is Edward Gant: prodigy, soldier, traveller, poet - but always and ever a showman.' 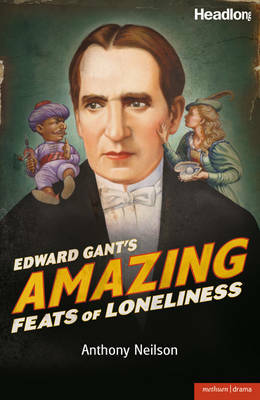 In 1881, the famed and enigmatic impresario Mr Edward Gant presented his renowned travelling show for the final time. The opiate-addicted actor manager showcased his troupe creating a spectacle of grotesquery, black comedy, mystery and magic realism. Over a century later, playwright Anthony Neilson has reconstructed this intriguing and fantastic historical event in a theatrical piece that combines the melodrama and extravagance with the painful loneliness that characterised a Victorian freak show. Neilson's play offers a strange and beautiful exploration of sadness and mortality, probing even the nature of theatre itself. 'Without further ado, I present for your astonishment the Extraordinary! The Terrible! The AMAZING FEATS OF LONELINESS.' Edward Gant's Amazing Feats of Loneliness was first produced at the Drum Theatre, Plymouth, in 2002, and was revived by Headlong Theatre and the Nuffield Theatre, Southampton, in February 2009.